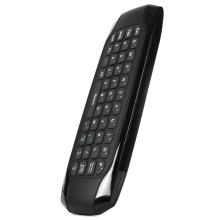 Supports Air Mouse, Wireless Keyboard, IR Learning Remote Control and Motion Sensing Game, four in one smart combo. 2.4G wireless connection via USB receiver, plug and play, enjoy long-range wireless control up to 10 meters. With 6-Axis inertial sensor, it can sense the change of the direction and speed, and just moving it directly in the air to accurately control the devices. Mini keyboard and air mouse combo, smart and portable size. 42 keys keyboard, comfortable to slide from key to key, easy to operate. Compatible with Android, Windows and Linux OS. Suitable for PC, HTPC, Smart TV, Android TV BOX, All-in-one PC, Network Player and so on. * Long press the "IR" button, indicator light will convert from fast flashing to slow flashing, then Air Mouse enter IR learning mode. * After the air mouse and the infrared transmitter of TV remote control are aligned, press the "Power" button on TV remote control. Then indicator light shall be on, indicating that the Air Mouse has receive the code value that from TV remote control. * Press infrared code value reserve storage key of the Air Mouse, the indicator light becomes slow flashing, which means that the Air Mouse has received the code values. * After the success of learning, you can press "IR" button to exit learning mode. Please note that when learning, do not use USB receiver.